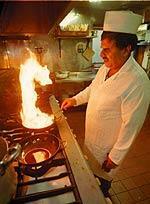 Adil's is one of the oldest and most famous balti houses in Birmingham. It advertises that it is open all afternoon, but today there are few takers - a mixed foursome in one corner, S and I in the other and a party of six blokes in the no-man's-land in between. The boys have embraced the BYO policy enthusiastically: a stockade of lager tins and alcopops, which they doggedly sink as the hour progresses, surrounds their table. The Adil decor is standard balti house. Menus are displayed under the glass table tops, the chairs are the cheapest available in the Ugly Furniture wholesale outlet and it is best to avert your eyes from the whirling horror of the bottle-green wallpaper with its gold stripes and flowered borders. The restaurant's many awards gleam on one wall, but the carpet could do with a Hoover. At one point, a door at the back of the room swings open to reveal the solitary occupant of a silent kitchen - a youth shuffling about in a long white coat. Ominous. Dangerous. Abort! Abort! But it's too late. Our food is arriving. Even now, I don't know if I can bring myself to dwell on the food that was brought to our table: trauma can take years to fade. Perhaps it is enough to say that while the curries were piping hot, the balti dishes they were served in were not and the food became cold very quickly (classic symptoms of a microwave reheat instead of food that has been freshly prepared). Some dishes contained ribbons of antique, desiccated flesh purporting to be chicken, and some of those red ribbons looked like leftovers from the tandoor oven chucked in to bulk it out. A starter of chicken pakora? Don't go there. Just don't. The best thing was the keema curry - a dish that would not suffer hugely in a microwave - which had been nicely made and was rich and good, with a fragrant depth of flavour. Elsewhere, there were faint signs of life in the occasional deep waft of cardamom here and there and in the green chilli bhajees, a plate of fat, squat green chillies dipped into a gram-flour batter and deep-fried, oh, sometime early the previous evening, at a guess. There was a sad, grey wrinkle to the batter surface and they tasted tired and sad - but I loved the idea of them. The bill at the Adil was incredibly cheap but that is still no excuse for such shockingly poor execution of grub. Restaurants - and this is a problem throughout the industry - that can't really be bothered with the effort of staying open in the afternoon and staffing up properly should do themselves a favour and just shut the doors. All the Adil is doing is giving balti houses and balti cooking a bad name - when it needs all the support it can get. For years, opinion has varied on the authenticity of balti cooking. Supporters claim that balti dishes originated during the Mogul empire in the Himalayan province of Baltistan and that the name refers to both the area of origin and the dish in which the food is cooked. Others say that it is just a scam, something that was invented in this country - right here in the Sparkbrook area of Birmingham, to be precise - as a way of giving a marketing boost to what is, in essence, the kind of standard curry that would be served in any Indian restaurant any night of the week across the British Isles. If there are antecedents, it is just a straggly nod in the direction of the cooking of the North-West Frontier and the most notable aspect of the cuisine - the regulation 9in cast-iron balti - is practically identical to the karahi pan. What is not in dispute is that the balti epicentre is still in Sparkbrook - there are claims that chicken tikka masala was invented here, too - although balti cooking is famously popular all over the Midlands and the north of England. Yet even the naysayers must agree that there are some points in balti's favour. First, there is the convivial nature of the meal, in which cutlery is replaced by giant slabs of nan bread that are shared by the table and used to scoop up the food. Secondly, the individual nature of the dishes means that you have a better chance of having something freshly and fragrantly cooked just for you. That is what happens in a good balti house, anyway. And I'm not leaving here until I find one. But which balti house to choose? There are more than 50 in Sparkbrook alone, and most seem to be strung along the Ladypool Road, crammed between the vegetable displays and shops selling shalwar kameez encrusted with sequins. Some of the restaurants have fancy furnishings, some are paved with white tiles, one looks particularly promising, filled with happy-looking girls in sherbert-coloured saris tucking into . . . burgers and chips. In the end, we alight on Al Frash, which has almost the same wallpaper as Adil's, only in navy blue instead of green. There are pink paper napkins folded into fans, wipe-clean place mats and very nice staff, including the lovely new boy. What is the best dish on the menu? "I don't know, I only started yesterday," he yelps. We order garlic chicken from the list of house specials, a lamb balti and a table nan. You can buy wine or beer from the shop down the road and the restaurant supplies jugs of tap water and glasses. They don't sell mineral water here; in a restaurant where starters such as a shish kebab are priced at 55p each, no one would be extravagant enough to buy it. From the kitchen there is a reassuring rattle of pots and pans and then later, a parade of impeccable dishes. The chicken curry is spiked with chilli, carpeted with fresh coriander and practically oscillates with garlic - outlandishly unsociable! The lamb balti is aromatic and tender. The table nan is larger than a doormat - fluffy, glazed, completely delicious and slightly sweet in the traditional way. Everything here is lovely enough to restore my battered faith in baltis. Al Frash is a no-frills place, but staff take a quiet pride in what they fragrantly do and they do it very well. *During a period of refurbishment, Al Frash has relocated to Zebs Cuisine, 100 yards along the road. Adil 1, 148 Stoney Lane, Balsall Heath, Birmingham (0121 449 0339). Al Frash, 186 Ladypool Road, Sparkbrook, Birmingham (0121 753 3120). Dinner for two excluding drinks and service, £15.